Source: Earned during the seasonal Crimson Days event. In the courtyard of the Tower, Lord Shaxx stares out at the Last City. He puts his foot up on the railing and sighs. Arcite 99-40 knows Shaxx's moods, because they are his own moods. He sidles up to Shaxx and follows his gaze to the horizon. "What's on your mind, boss?" he asks with the friendly rhythm of a local bartender. Shaxx is quiet for a long time, but Arcite is indifferent to the passage of time. When Shaxx speaks, it is with a deep, sobering gravity. "Today," he says. "I will marry them all." Hours later, after Arcite has finished tying off the bouquets and gathering the doves from the mountains beyond the City, Shaxx addresses the courtyard. "Guardians," he booms. "These Crimson Days are a time to renew our bonds to one another. We gather together. We remember what we owe each other. We declare our love." He holds up a bow for the crowd to see. "Bring your fiery passion to the Crucible. Prove your devotion to your Bond." He pauses. 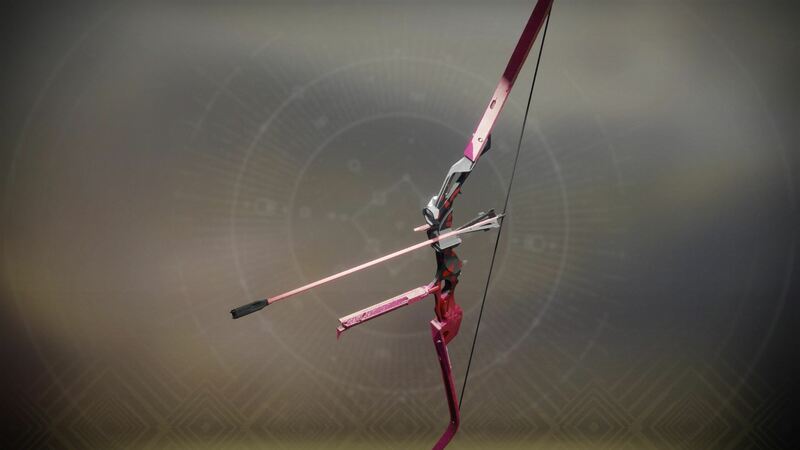 "To those of you who win this bow... I offer my hand in marriage! Take it or leave it!" Arcite releases the doves. Someone screams. Doves have not been seen in the Last City for a long time. Wait, I thought he was marrying Mara?! What the what? 0/10 The helmet should come off. 10/10 The helmet stayed on.